Samsung Small Signage meets the reliability and durability demands of your business environment. Businesses no longer have to rely on consumer-oriented tablet alternatives that can malfunction or lose picture quality when used at length in retail and professional settings. With performance guaranteed for 16 hours a day, 7 days a week, and supported by a two-year warranty, you can confidently operate the small-sized display at the pace of your business. Beyond reliability, Samsung Small Signage expands functionality and convenience with advanced multi-device connectivity. 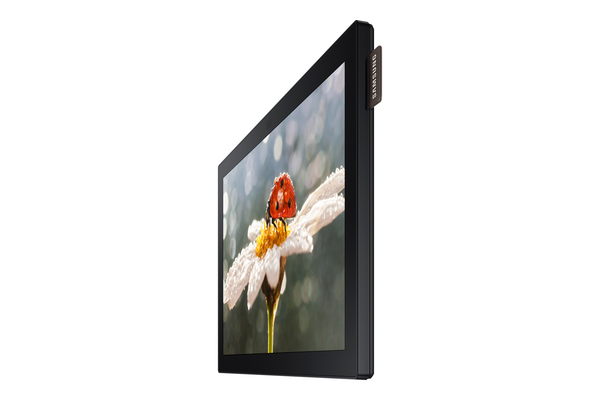 Unlike consumer-geared tablets that can require a separate router or connection, the DBE-T display features embedded Wi-Fi to allow screen sharing among PCs, tablets and smartphones. Additionally, the DBE-T display offers ports for HDMI, USB downstream and upstream, and SD cards, improving productivity and eliminating potentially distracting on-site clutter. As a highly reliable and capable SMART signage solution, the Samsung DBE-T display is the perfect tablet alternative to accommodate any of your device needs. The Samsung Small Signage DBE-T display transforms customer engagement into a multi-sensory experience. The display’s interactive touch screen with five-point, two-drawing touch capability makes product and service navigation user-friendly and personalized. This helps promote customer engagement, which in turn, drives new revenue opportunities. 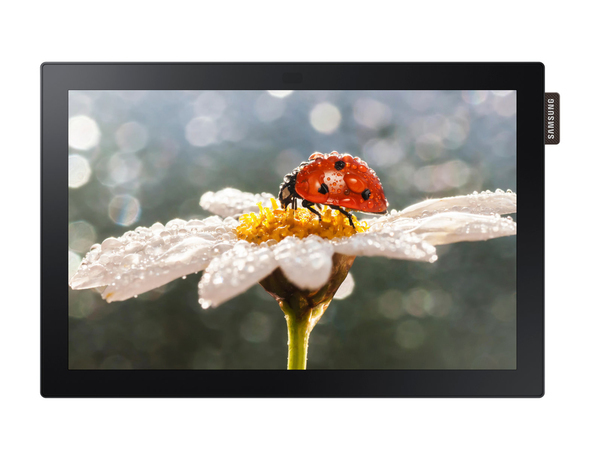 As a PC-less display, the DBE-T display’s touch function comes fully integrated. Since the DBE-T eliminates the need for a separate PC or content management software, businesses can deploy the integrated solution without incurring additional equipment and installation costs. Built-in 5 W speakers further elevate interactivity by connecting on-screen content with dynamic sound. By combining these professional-grade features with the display’s sleek appearance and uniform bezel design, the DBE-T creates a truly memorable experience for customers. While small- and mid-sized businesses (SMBs) and small office/home office (SOHO) business owners may not need to connect several displays with real-time or frequently-changing data as larger retail and corporate content managers require, they still value the convenience and efficiency of effective content management. As an alternative to MagicInfo DataLink, Samsung’s Data Module solution is specifically designed with SMB and SOHO users in mind. Instead of requiring a MagicInfo server and DataLink license fee, the embedded Data Module connects with a business owners’ existing local data storage*. Information is then shared automatically from the data storage and transmitted to the MagicInfo Author tool. Using Data Module-capable Samsung Small Signage, SMBs and SOHO business owners can thus share timely and informative content more effectively with a reduced total cost of ownership (TCO). For retail, corporate and transportation environments where multiple displays are installed and need to be remotely managed, such as QSRs, grocery stores, conference rooms and airport terminals, the time and effort required to update frequently-changing data in real-time can strain business operations and staff effectiveness. As a server-based content management solution, Samsung Small Signage’s MagicInfo DataLink content management program is ideally suited to address these demanding usage scenarios. The MagicInfo DataLink solution allows content managers to easily and instantly update information across displays based on frequently changing data, such as exchange rates and customer waiting lists, as the DataLink server and MagicInfo Author tool automatically share information from a user-designated administrative server. As a result, you can retrieve, update and transmit content and improve customer awareness and satisfaction with greater convenience and less effort required.